Q: What should I do if the door comes open in flight? Good example: On April 28, 1988, Aloha Airlines flight 243 suffered severe structural damage. An 18 foot length of the top half of the fuselage blew off. One flight attendant was immediately swept overboard, but everybody else survived. The wind blew away all the pilots’ charts and checklists, and the noise was so great that they had trouble communicating, but they were able to fly the airplane and land at Kahului airport. They carried out the required checklists from memory. Bad example: On December 29, 1972, Eastern Airlines flight 401 was flying over Florida. This was a brand-new Lockheed L-1011 jumbo jet, with no problems except for one of the three small green lights that are supposed to indicate when the landing gear is down and locked. All three pilots were so distracted by the burned-out indicator that they didn’t notice that the airplane was gradually descending. It crashed into a swamp. This was, at the time, the second-deadliest single-aircraft disaster in United States history. Don’t let anything like this happen to you. Fly the airplane. If you have a copilot, make sure there is a clear delineation of responsibilities: One guy is entirely responsible for flying the airplane, while the other guy fusses with the landing gear or whatever else. A burned-out indicator should be nothing more than a minor nuisance. (Hint: Swap bulbs with one of the other indicators.) If you neglect basic flying duties, you make the problem very much worse. Bad example: The following scenario has occurred many times: Shortly after takeoff, the passenger door pops open. The pilot becomes distracted. This leads to fatal stall/spin accident. Don’t let this happen to you. First of all, double-check the door latches before takeoff. If the door is not properly latched, it could pop open, perhaps during the takeoff roll, perhaps later. Secondly, if a door does come open, fly the airplane! The safest thing to do is to make a normal landing and then close the door. If the door is hinged at the front, aerodynamics guarantees that the door will not open more than 2 or 3 inches. This is enough to make the cockpit noisy and drafty, but it is not the end of the world. Fly the airplane! In some cases is may be possible to close the door without landing. Wait until you are at a safe altitude and well away from other aircraft. Maintain a safe airspeed. If you have a copilot, work out a clear division of responsibility: One guy flies the airplane while the other guy fusses with the door. Opening a cabin window and/or slipping the aircraft may make the door easier to close. Still, the point remains: You don’t have to close the door, but you do have to fly the airplane. Sometimes the door is hinged along the top or bottom. This includes many baggage doors, as well as some main entry doors, such as “gull wing” doors or “air stair” doors. If such a door comes open, it might well open all the way. This creates an impressive amount of draft, noise, and drag. The open door might bang into the fuselage, and might even separate from the aircraft. In any case, fly the airplane! If you don’t maintain control of the airplane, a bad situation becomes very much worse. If a passenger appears to be having a heart attack, this is a very serious problem. Still, you will make it very much worse if you neglect your basic piloting duties. All flying involves a goodly amount of multitasking and division of attention. If you can safely fly the airplane and still give part of your attention to the passenger, that’s great. Get on the radio and ask for assistance. Ask for vectors to the nearest suitable airport. Ask for an ambulance to meet you there. Ask for first-aid instructions. Descend to a lower altitude as soon as possible. Administer aspirin if available. Administer nitroglycerin if available. Administer oxygen if available. In any case, though, your first priority is to fly the airplane. This includes carrying out all the normal checklists. Engine failure is a serious problem. Don’t make it worse by neglecting your basic piloting duties. There are many items on the engine-out checklist, but the first priority is always to maintain a reasonable airspeed, attitude, heading, and coordination. When making an engine-out landing, don’t forget the pre-landing checklist. This includes extending the landing gear, unless there is some special reason not to. Do not try to debug the landing gear or anything else on final. For that matter, do not do any debugging anywhere near the traffic pattern — it is too close to the ground and (usually) too congested. Get out of there. If there is a control tower, don’t forget to tell ATC what’s happening: “Tower, Five Seven Tango has some uncertainty with the landing gear.1 We’d like to leave the pattern while we investigate”. Then climb to a reasonable altitude, away from the airport, and take your time fixing the problem. No matter how bad the problem, don’t panic, and don’t give up. There is no crying in baseball, and there is no giving up in aviation. After the aircraft is parked and tied down, then you can set aside your pilot-in-command responsibility, not before. This section discusses what you should do if your engine quits while you are airborne.2 This mainly applies to single-engine airplanes; additional procedures for multi-engine airplanes are covered in chapter 17. It is important to have an emergency checklist You should commit it to memory, and review it right before each flight. Do not wait until you are confronted with a “deafening silence” to figure out what is on the emergency checklist, and why. Aviate — best-glide ______ KIAS and trim; configure flaps & gear etc. Navigate — pick a field; turn toward it. Communicate — 7700 + 121.5 or current. The first item, Aviate, is clearly the first priority. No matter what happens next, you want to be in control of the aircraft when it happens. There are lots of scenarios where an engine failure results in a critically low airspeed (especially if somebody is dumb enough to try to maintain the pre-failure pitch attitude, or (worse) the pre-failure altitude while deciding whether or not there has been a failure). If you fly with a light touch, as you should, you will have less of a problem with the airspeed. If the airspeed does get low you must re-establish the proper glide speed3 immediately, even if it means cashing in some precious altitude. The opposite extreme is possible, too; namely it is quite possible that at the time the emergency begins, the aircraft is going much faster than the best-glide speed. This is not so immediately dangerous, but the longer you take the establish the proper glide speed the more energy will be thrown away in the form of unnecessary parasite drag. In this case, gently zoom upward, converting airspeed to altitude. Retrim. In addition to trimming for the correct airspeed, you should configure everything else appropriately, as discussed in section 15.2.3. The second item, Navigate, is clearly next in importance. In section 15.2.5 there is a discussion of clever techniques for judging which fields are within gliding range — but you should not pick a field at the limits of this range if there is anything suitable that is close. In particular, start by looking down at a 45 degree angle, or even straight down. If it is right below you, it is probably within gliding range! The next item is Investigate. Sometimes when the engine quits, you know immediately what the problem is. Ninety percent of the time, the problem is fuel-related, so you should reflexively switch tanks and turn on the boost pump as appropriate. Then turn on the carburetor heat, because it is only effective while the engine is still warm. Then go left-to-right across the panel, checking everything in turn. Make sure the primer is in and locked. See if the engine runs better on the left magneto, right magneto, or both. See if it is happier with a leaner or richer mixture. In most cases the propeller will keep turning, just due to the action of the relative wind, even in the total absence of engine power – but if it stops, use the starter to get it going again. Give everything a once-over before spending too much time on one particular item, unless you are pretty sure you know what the problem is. And above all, don’t forget to fly the airplane. The next item is Communicate. If you are already in contact with a controller, it is almost certainly a good idea to stay on that frequency. If, on the other hand, you have any doubt about what frequency to use, go immediately to the international distress frequency, 121.5 MHz. That’s what it’s there for. Similarly, if you have been assigned your own transponder code, don’t bother to change it unless ATC asks you to. On the other hand if you are presently on the all-purpose code 1200, do not hesitate to switch to the emergency code, 7700. That rings alarm bells (literally) at ATC and highlights you on the controller’s radar screen. Some people argue you should Communicate even before you Investigate. Certainly if you are in instrument meteorological conditions you should tell the ATC of your predicament even before you Navigate, (1) so they can vector you to a landing field and (2) so they can clear out the airspace below you. The fifth item on the list is Secure. It is amazing how easy it is to forget this item. Wouldn’t you hate to make a beautiful power-off approach to an ideal field — and then forget to extend the landing gear? At 100 feet AGL, make sure you pull the throttle and mixture to idle cut-off. The main reason is that you don’t want the engine to roar back to life just after touchdown. This could easily happen if (for example) there had been a fuel shortage, and the flare freed up some fuel from a corner of the tank. The reason for doing it at 100 feet AGL is to give the engine a chance to cool down, reducing the risk of a post-crash fire. Closing the fuel-tank shutoff valve helps reduce the risk of fire — but in most planes it is not a sufficiently quick way of stopping the engine so be sure to pull the throttle and mixture also. Shutting off the engine will be difficult; it will require overcoming a huge psychological barrier. After all, you’ve spent the last several minutes trying to restart the engine, and now you are supposed to shut it off. Make sure you have made this decision in advance: promise you will shut the engine off at 100 AGL. Switching off the master also reduces (somewhat) the risk of fire, but in an aircraft with electric flaps and/or landing gear, you might want to save the master switch for last. Let’s consider the case of engine failure during climb. This is somewhat more critical than engine failure during level flight, because of the lower airspeed during climb. This is particularly critical during initial climb, when you are still close to the ground. The first thing you must do is lower the nose. You must lower the nose a lot. You must lower the nose right now. This may sound obvious and easy, but experience shows that many pilots don’t respond properly. There are complex psychological issues. Part of the story is that the expectation is so strong that the engine should work that pilots initially don’t believe that the engine has actually failed – despite clear observational evidence that it has. It is super-important to practice engine failure scenarios, so that you can instantly perceive engine failure and instantly respond properly. Start by practicing at altitude, in the practice area. Enter a low-airspeed climb, reduce engine power to idle, and then immediately configure for best glide. Among other things, carefully note the pitch attitude associated with best glide, so that you can instantly put the aircraft into that attitude without reference to instruments. Some books say that you need to “push on the stick”. Well, it’s true that you need to push on the stick, but that’s not where the emphasis should be. Pay attention to the pitch attitude, which along with direction of flight is your best indication of angle of attack. Do whatever you need to do with the stick to obtain and maintain the proper pitch attitude. Then trim. You may be wondering how rapidly to lower the nose. The answer is, as rapidly as you can without pulling negative Gs. After you have mastered the procedures at altitude, find a long, long runway where you can take off, climb to an altitude of a couple hundred feet, reduce power, and land straight ahead. Do this with an expert instructor, and do it with plenty of altitude the first few times, so that if you don’t do everything right you have time to recover. Watch out for other traffic, and make sure other traffic knows what you’re doing. Here’s another technique that doesn’t require quite so much runway length: Make an almost-normal approach to the runway, start a go-around, and then reduce engine power to idle during the go-around. Lower the nose and land straight ahead. If you adjust the approach path judiciously, you can have almost the entire runway available for the power-off landing. This technique is particularly useful when (because of density altitude or whatever) your aircraft doesn’t have very good takeoff and climb performance. In the “clean” configuration, the airplane will be able to glide much farther, perhaps twice as far as in the “dirty” configuration. If you start out at low altitude, twice nothing is nothing, so it may not be worth bothering to configure for glide; just configure for landing and be done with it. On the other hand, if you start out at a reasonable altitude and are trying to glide a long ways, then you want flaps retracted, landing gear retracted, and propeller in the coarse pitch (low RPM) position. Some books say that once the flaps are down, you should leave them down; they point out that at a low airspeed (below the bottom of the green arc) retracting the flaps will cause an immediate stall. I look at it somewhat differently. This situation actually arose on my private pilot checkride. I was at 1000 AGL, with two notches of flaps extended, on downwind just ready to turn base. Then Tower asked me to extend my downwind. By the time I was able to turn final, I was nearly two miles from the airport. At this point the examiner caused a simulated engine failure. It’s a long way to the airport. If I don’t do everything right, we won’t make it. It is important to glide at the right airspeed. I know what the best glide speed is in the clean configuration, but I have no idea what the best glide speed is in the current configuration. I’ll bet there is no such thing as best glide in this configuration. I’ve got to get the flaps up. I’m really slow, near the bottom of the green arc. If I just retract the flaps, I might stall. The airplane stalls at a definite angle of attack. No airplane ever stalled at zero angle of attack. It’s aerodynamically impossible. I’ve got full control over angle of attack. Watch this! At that point I shoved forward on the yoke. Zero angle of attack. Zero G. The examiner started gently floating out of his seat, but he didn’t say anything. I retracted the flaps all at once. I continued the zero-G pushover until we approached the canonical best-glide airspeed. Then I raised the nose, trimmed for best glide, and quickly ran the rest of the emergency checklist. I even rolled in some left rudder trim. The glide took us to a place in the weeds about 100 yards short of the runway. I flew right down into ground effect and then flared. While skimming in ground effect I extended the flaps. When we reached the runway the stall warning was already on. I plopped onto the runway. We were stopped before reaching the big painted number. You can, of course, glide with flaps and/or gear extended if you want to make a steep approach to a nearby field. Also, when you are through gliding (i.e. when you are ready to flare), extend the flaps, so you can touch down at the lowest possible speed. We now focus on the special case of engine failure shortly after departure, since that is a relatively common and very critical case. Many people are tempted to turn back to the airport, but this is not usually the right answer. Every situation is different, so the following analysis can’t possibly fit them all exactly. On the other hand, it is worth your while to plan in advance. Know what your options are. For each phase of flight, make sure you have a backup plan (“Plan B”) appropriate to the situation. Be ready to carry out Plan B at a moment’s notice. Here is a piece of simple but important advice: if you can land straight ahead, do so. As an extreme example, consider this: a small plane departing from runway 31L at JFK (length: 14,600 feet) could climb to 500 feet, lose the engine, and still land straight ahead on the same runway with plenty of room left over. Here’s another piece of simple advice: don’t turn back unless you are sure you can make it — and there are lots of situations where you can’t make it. For example, consider a fully loaded Cessna 152. It has a power-off glide ratio of ten to one. Unfortunately, in no-wind conditions the climb gradient is less than ten to one. Therefore, even if the airplane could turn on a dime, at every point on the return trip the airplane would be below where it had been on the outbound trip. Then when you take into consideration the altitude lost while getting the airplane turned around, it is easy to see why the airplane cannot possibly return to the point where it left the ground. Under such conditions, the farther you have flown on the departure leg, the more options you have for an off-airport landing, and the more impossible the turnback becomes. An important factor to take into account is that a simple 180 degree turn does not suffice to return you to the departure runway. The airplane will travel an appreciable distance sideways during the turn. You won’t need to do a full-blown procedure turn, but you will need to do some additional maneuvering that makes an already-bad situation worse. Given a sufficiently long runway, the airplane may be able to return to a point on the runway closer to the departure end — which is just fine. Again, imagine departing runway 31L at JFK, and climbing straight ahead. Suppose the engine quits at a point 1/2 mile beyond the departure end of the runway. At that point you should have more than a thousand feet of altitude. You should be able to reverse course and make a downwind landing near the beginning of runway 13R5 even though you could not glide back to the point where you lifted off. A modest headwind on departure will help keep the airplane near the airport during the outbound leg, and will help hurry it back to the airport during the return trip. This sounds wonderful, because it increases the possibility that you can glide back to the runway. The trouble is that (whether or not you make it back to the airport) you are faced with a downwind landing. Even a modest amount of tailwind (say 15 knots) can have a tremendous effect. Suppose your airplane is capable of touching down at 55 knots. If you land into the wind, you have a groundspeed of 40 knots, but if you land downwind you have a groundspeed of 70 knots. Runway usage depends on the square of the groundspeed, so the downwind landing will use three times as much runway: (70/40)2 = 3.06. Also, in a collision, the amount of damage and injury is typically proportional to the square of the groundspeed — so if you turn downwind and don’t manage to land on the runway you are in very big trouble indeed. Here’s another option for you to consider: suppose that your airport has a second runway running crosswise to the active runway. If your engine fails somewhere over the cross runway, you might be able to turn 90 degrees and land on it. Even in less ideal cases, it is quite likely that a crosswind landing on a different runway (or even a taxiway) is easier and safer than a downwind landing on the departure runway. If you are really concerned about engine failure during the departure climb, and the airport is the only safe landing zone for miles around, you should begin a gentle turn almost immediately after liftoff. Then if the engine quits, you’re closer to the airport and you’ve got a more convenient heading. I don’t recommend this in general, because engine failure is not the only consideration. For starters, we need to worry about causing a mid-air collision in the pattern. A turning departure climb toward the traffic-pattern side of the runway would cause you to enter the downwind leg from below at just about the point where inbound traffic is entering from the 45 degree leg. In many cases, engine trouble results in partial rather than total power loss. You have to decide whether continued operation of the damaged engine is safe, but if so, it gives you some more options. Even if the aircraft is not capable of climbing on the remaining power, the rate of descent may be dramatically reduced. Think of the aircraft as a noisy glider with a good glide ratio.6 It may be capable of “gliding” to places that a totally unpowered aircraft could not. I reiterate: don’t try to turn back to the airport unless you are sure you can make it, and in most typical cases you can’t. You should find a nice road or field and put it down under control. It helps a lot if you have practiced forced landings, so you know the power-off performance of your airplane and how to land from non-ideal approaches. Another very serious consideration is this: reversing course smoothly wastes valuable time and energy, whereas reversing course quickly requires radical maneuvering. Nobody wants to recommend that pilots perform radical maneuvering at low airspeeds close to the ground in an unplanned situation. It might help you return to the runway, but there is a much greater chance that it will provoke a stall/spin accident. An off-airport landing is not usually fatal, whereas a stall/spin accident usually is. Another reason for not attempting to turn back is that most people are so surprised by an engine failure that it takes them a few seconds to regain their wits. During this interval, precious time, energy, and distance have been wasted, so even though it might originally have been possible to turn back, it no longer is. Indeed, (unless you are very well trained) your first reaction will be completely wrong — not just late, but dead wrong. When the engine quits, the airplane’s nose will tend to drop. The flight path has changed from, say, a 10-to-1 climb to a 10-to-1 descent, so to maintain constant angle of attack the nose must drop a huge amount — 12 degrees. You may think “Gee, I don’t want the nose to drop” and may be tempted to pull back on the yoke. This is a sure way to kill yourself. Please, do not think of the yoke as the up/down control. When the engine quits, the airplane is going to descend. The only question is whether you will spin in, or glide to a controlled touchdown. Remember, you can survive an off-airport landing if you touch down under control. The obvious reason why you want to maintain control is that the rate of descent you get in a normal glide is much less than what you get if you stall and let it “drop in” — not to mention what you get in a spin. A less obvious but still very important consideration is this: If the airplane is not under proper control, it is likely that one wingtip will hit before anything else. This will cause the aircraft to cartwheel, causing tremendously more damage and injuries than if you had landed under control and just skidded to a stop. In any case, you need a plan for what to do with the controls. Your first priority is to maintain a proper angle of attack. Do not attempt to hold the nose up; let the nose go down (or push briefly to help it go down). Fine tune the pitch attitude and trim to maintain the best-glide airspeed. In a forced-landing situation, your glide path will be rather steep. The lift-to-drag ratio of typical Skyhawk or Cherokee (in best-glide configuration) is about 10-to-1, which corresponds to an angle of six degrees. This is perhaps twice as steep as a typical power-on approach. It is even somewhat steeper than the typical “power off” approach, since that normally really means “engine idle” and an engine at idle produces noticeably more power (and less drag) than an engine that is really off. We can use the rule of thumb: a thumb at arm’s length subtends four degrees.7 In figure 15.1, you can tell by the smoke drifting up from the shack that the wind is negligible, so you should be just barely able to glide to any point that is a thumb and a half below the horizon. Figure 15.1: What Landing Sites Are Reachable? In the presence of wind, the circle of possible landing sites will be shifted downwind from the circle described in the previous paragraph. Suppose you are gliding at 60 knots (airspeed) into a 30-knot headwind. Your groundspeed has been cut in half, so your glide will be twice as steep as in the no-wind case. Your destination must now be at least three thumbs below the horizon. Now let’s assume you have picked a field and are gliding toward it. Now your ability to perceive angles really pays off. Whereas in a normal approach you use engine power to maintain a pre-determined glide angle and destination, in a maximum-distance glide the glide angle is fixed and you want to perceive what the destination is. Here is the key idea: there will be some landmark that remains some fixed angle below the horizon, and that is the point toward which you are gliding. Pick a point. If its angle down from the horizon is decreasing, you will land short of that point. If its angle is increasing, you will overfly that point — unless you do something. There are two critical reasons why you always need to explicitly identify the point to which you are gliding. For one, you need this information for angle of attack control. Remember, the angle of attack is the angle between the wing and the direction of flight. If you can’t perceive the direction of flight you won’t be able to perceive the angle of attack (see chapter 2). Secondly, you need to know whether your present glidepath will cause you to land long or land short; the earlier you can perceive this the sooner you can make any necessary correction. A small correction early is better than a big correction late. You should not pick a field that is right at the limit of the airplane’s gliding ability, because you’ll wind up short if anything goes wrong. Pick a field that is substantially closer than the limit, since you can always lose altitude by circling, adjusting the length of the base leg, extending flaps, slipping, et cetera. Strategic turns are appropriate early in the game; flaps and slips are more appropriate on short final. S-turns on final are almost never the best way to eat up unwanted altitude. Small-angle turns have almost no effect, and large turns take too long to perform, and take your chosen field out of sight temporarily. Furthermore, after two turns (one to the left and one to the right) you will be back on your original heading, but offset laterally; you need to make two more turns to get back on course. If you have time and altitude to do all that, there are better things to be doing. If you are on long final and can (using flaps and/or slips) keep the field a constant angle below the horizon, you are all set. Glide straight on in. If you are on long final with excess energy, or if you are approaching the field from a substantial angle relative to the intended direction of landing, do not aim directly for the field. 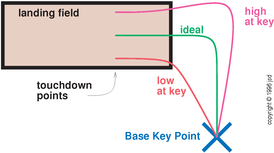 Aim for the so-called base key point (figure 15.2), i.e. the point where the base leg begins. Another point that is made in the figure is that you can use the width of the landing field to your advantage. You may be unaccustomed to this, since at an airport the tradition is to land always as close as possible to the runway centerline. Also, do not plan your final approach to take you to the threshold of your chosen field. No matter how long or short the field, aim for a point one third of the way along the field. Remember there are lots of things that could steal energy from your glide, and you really don’t want to land short. than to hit the trees at the near end at 60 knots. The energy, the expected damage, and the expected injuries all depend on the square of the airspeed. The square law means the 20-knot collision involves nine times less energy than the 60-knot collision. One common reason why you might wind up landing short (despite a well-planned glide) is the infamous decreasing headwind on final, as mentioned in section 12.12. If you are gliding at 70 knots, and you lose just ten knots due to a windshear, you will have to descend 60 feet to regain your proper airspeed.9 That 60 vertical feet (at a ten-to-one glide ratio) corresponds to 600 feet of horizontal travel. If you are unprepared for it, finding yourself 10 knots slow, 60 feet low, and/or 600 feet short during a forced landing is no fun. As discussed in section 21.3, you need to have margins of safety and layers of protection. You don’t want to be in a situation where any one failure causes harm. As discussed in section 21.8, you always want to have not just plan A, but also plan B, plan C, plan D, et cetera. Far and away the most common reason for losing engine power is fuel mismanagement. This includes running out of fuel as well as contamination of the fuel. The good news is that such problems are relatively easy to prevent. It pays to be careful. I am pretty methodical about checking the fuel sumps. I used to check for little droplets of water at the bottom of the sampler. Once, after completing the check, I was about to dump out the sampler and begin the flight, but I decided to take a closer look. Then I noticed tiny drops floating at the top of the sampler. It turns out the entire tube was full of water, with just a tiny bit of fuel mixed in. I went back to the plane and got another tube of water, and another, and another. It turns out that the fuel vendor had just switched to a new pump/tank system, and had sold me more than a quart of water (at AVGAS prices!) along with the fuel. Check the fuel sumps if the aircraft has been sitting overnight or longer. Humid air in the tanks can condense at night. The problem is worse if the tanks are less than 100% full, because that leaves more room for air. Because of the daily temperature changes, new air gets into the tank each day. The condensed water, hiding underneath the fuel, does not re-evaporate — it just accumulates day after day. Check the sumps if the aircraft has been refueled since the last flight. If you do detect water after refueling, notify the fuel vendor immediately, so that one of your less-meticulous fellow pilots doesn’t get harmed. Then, wait a few minutes and check your tanks again. A fair amount of water can be suspended in the fuel in the form of tiny droplets that take a while to settle out. Check the fuel sumps if the airplane has been sitting in the rain even for a short time. The filler caps have been known to let water leak in. Check the color of the fuel. Different octane grades are color-coded differently. The color is rather pale, so it may help to look lengthwise down a long column of fuel. Check the odor of the fuel. If it smells like jet fuel, watch out. There have been many cases where an airplane that runs on AVGAS has been mis-fueled with Jet-A. The engine may run on the mixture for a while, but it will be rapidly destroyed because of detonation in the cylinders. If you suspect here is a mixture of Jet-A along with AVGAS in your tank, here’s how you can check: Put a drop or two of the suspect fuel on a piece of paper. For comparison, put a similar amount of known pure AVGAS on the paper nearby. The AVGAS should evaporate rather quickly. The Jet-A, if any, will remain behind, leaving a translucent spot on the paper. There are several ways to detect a sample that is 100% water. For one, the water will not have the right color, since the fuel color-code dyes are insoluble in water. Secondly, water has a noticeably different density and viscosity — it just doesn’t “slosh” the same way. It also doesn’t evaporate at the same rate. Last but not least, you can add a drop of water to your fuel sampler and make sure it goes to the bottom. Before each flight, peer into the tank to make absolutely sure the fuel quantity is OK. Cross-check what you see against the gauges. One fellow I know bought gas and got ready to take off, but noticed that the tanks were nearly empty. The service crew had refueled the wrong plane. Another fellow filled the tanks on Sunday and went to fly again on Friday. The tanks were nearly empty because of a leak. Don’t switch tanks just before takeoff. On typical airplanes the engine can run for two or three minutes just using the fuel stored in the carburetor and engine sumps. That’s just long enough to get you into big trouble if you use tank “A” for taxi and runup, and then switch to tank “B” for takeoff. What if tank “B” is contaminated? What if it is empty? What if there is a blockage in the lines? What if you accidentally select “Off” instead of “B” during the switch? Et cetera, et cetera.... If there is a problem with tank “B”, you’d like to find out about it before starting your takeoff roll. If you absolutely must switch to tank “B” for takeoff, do a duplicate runup on that tank, and wait long enough to consume the fuel in the lines and sumps and prove that you are actually getting fuel from tank “B”. By the same token, it isn’t smart to switch to a new tank on final approach. Plan ahead; do your tank-switching at an altitude and at a location where if something bad happens you’ll have a chance to do something about it. On a training flight, you might want to let Tower know it is only a simulated problem, so they don’t get unduly worried. When in doubt, ask the instructor, but usually you know it’s a simulation because of the satanic grin on the instructor’s face. Engine trouble (or other trouble) during the takeoff roll is discussed in section 13.7, especially section 13.7.6. Being lost, which might or might not be an emergency, is discussed in section 14.7. In retrospect, I wish I hadn’t pushed quite so hard. A half-G pushover would have been more than sufficient, and would have kept the examiner from floating out of his seat. Still, though, I had the right basic idea. I.e. the reciprocal direction on the same piece of pavement. Section 17.1.2 discusses the multi-engine version of a “noisy glider”. See section 12.3 for more discussion of how to measure angles. Note this method gives you control of your destination using at most two large-angle turns, whereas S-turns on final would require using four. Remember the law of the roller-coaster: 9 feet per knot, per hundred knots.